Ice Cream Pie is the perfect summer dessert, nice and cold on a hot day. 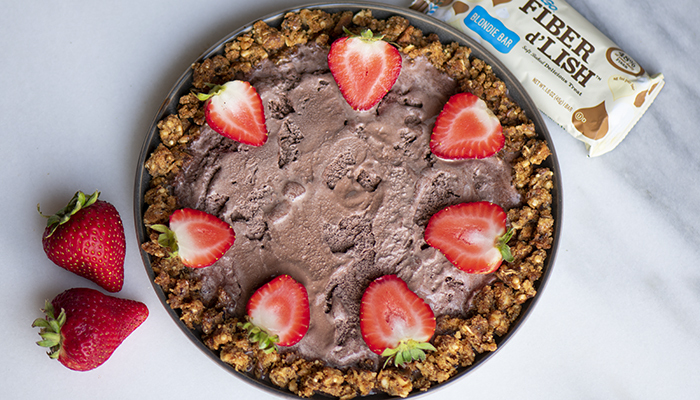 But what makes this chocolate ice cream pie even better is the NuGo Fiber crust! With high fiber, it is a dessert you will not feel guilty about! 2 pints of Chocolate Ice Cream or your favorite flavor! Start by forming the Fiber d’Lish Blondie Bar into the pie crust. Soften ice cream and layer it on the bottom of the pie crust. Cut up strawberries and place on top. Put the newly formed pie back into the freezer until firm. Enjoy!